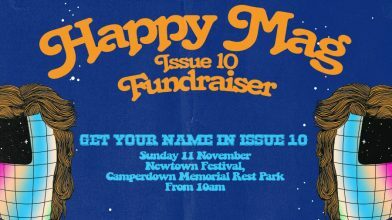 Camperdown Memorial Rest Park will light up on Sunday, November 11 for the 40th anniversary of Newtown Festival, a massive celebration of the most diverse and creative pocket of Sydney. The annual festival will combine music, arts, literature, families and friends for the Inner West’s biggest weekend of the year. Curated and run by the Newtown Neighbourhood Centre, the festival raises funds to keep Newtown’s vibrant arts and culture community alive and thriving. With so many events going on throughout the day, it’s hard to know where to even start. Here are our top picks for Newtown Festival 2018! NOOKY burst onto the Sydney music scene back in 2010 and has since made a name for himself as one of the most important voices in Australian hip-hop. His appreciation of culture really shows in his music; he is a proud member of the Yuin nation and is proactive in his quest for recognition of Indigenous Australians in Aussie music. He’s currently signed to Bad Apples Music, Briggs’ record label. He’s shared stages with some of the biggest names in Aussie hip-hop, including Urthboy, A.B. Original, Jimblah and The Daily Meds. Exhibitionist is the solo project of Sydney based multi-instrumentalist and all-round wonder woman Kirsty Tickle. Tickle’s unique blend of intense power and raw vulnerability make her one of the most interesting performers in the local music scene. Her first single Hands was released in early 2017 and she has continued to receive notable praise ever since. When she’s not playing solo, Tickle performs in art-noise two-piece Party Dozen. Exhibitionist is an act not to be missed. Sydney four-piece Palms will perform their infectious brand of thrashy indie rock at this year’s Newtown Festival. They don’t play all too often, so make sure not to miss out! Palms were formed way back in 2011 by former Red Riders’ singer Al Grigg plus drummer and backing vocalist Tom Wallace. Palms’ sophomore record Crazy Rack was released in 2015. Georgia Mulligan has continued to wow audiences since her debut EP Our Blood to Part was released back in 2016. In 2017 she was selected by triple j to open the Main Stage of Berry’s Fairgrounds Festival, joining a lineup that included Aldous Harding, Gang of Youths, Marlon Williams and Japanese Breakfast. Mulligan also played at Happy Mag’s recent NZ Week showcase. Her most recent single, The Dark, has been killing it on the local airwaves. Catch Mulligan on stage again in a few weeks at Newtown Fest. 14-year-old South Sydney rapper The Kid Laroi has been causing a stir online for being crazily talented and stupidly young. The Kid Laroi was announced as a triple j Unearthed High finalist this year, and was at school when the finalists were announced. Catch The Kid Laroi and witness one of the most talked about up-and-coming hip-hop acts in the country before he blows up! Newtown Festival 2018 is taking place at Camperdown Memorial Rest Park on Sunday, November 11. Grab details via Facebook or their website. Similar to 2017, there will be an expected contribution of $5 in place at the festival this year. Those contributing $10 or more will receive a Newtown Festival eco-friendly water bottle.